Mr. P’s Blind & Shade Company is proud to introduce this new and exciting innovation in window treatment motorization. 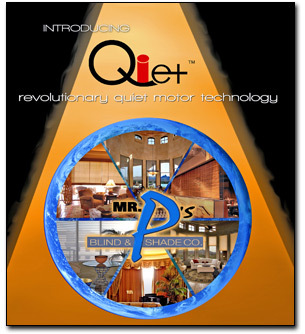 QIET was developed by Mr. P’s Blind & Shade Company and Somfy Systems. The combination of Mr. P’s proprietary engineering and components with Somfy’s Sonesse series motors is what makes QIET. Your beautiful window coverings can now have motorization that’s quiet and controlled by many new and exciting options. Up to now, quiet motors had only one basic 24V DC control protocol. It used very expensive (proprietary) wiring and locked you into limited product options. With QIET, your product options are limitless. 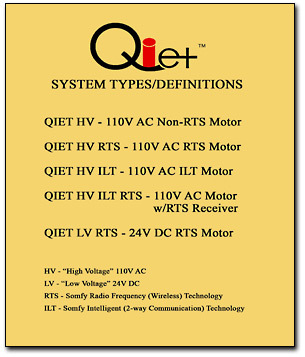 QIET was developed with five different control protocols. You decide what products you want and Mr. P’s can help you choose the QIET motorization that’s best suited for your project. With the dramatic increase in home automation projects, QIET has been at the forefront of technology. Mr. P’s works closely with integrators and home theater experts, conducting frequent seminars to educate on the advantages of motorization in providing a total lighting solution. At Mr. P’s new State of the Art Manufacturing Facility, your QIET products are produced locally, ensuring the utmost in quality and reliability. Service is the most important component in everything done at Mr. P’s Blind & Shade Company.